A few years ago, there was a lot of discussion about “pre-existing conditions” in the news media as part of discussions on the impact of Obamacare; however, for accident victims pursuing claims for injuries to shoulders, hands, ankles, wrists or other severe harm like TBI (traumatic brain injuries) and spinal cord injuries, the issue of a “pre-existing condition” or “pre-existing injury” involves different concerns. Victims with a personal injury claim, are concerned about this issue from the standpoint that defense counsel may challenge them with an allegation that their injuries and need for medical care coverage (therapy needs, rehabilitation care, lost wages, etc.) are not due so much to the current injury or accident, but due to something else altogether. Pre-Existing Injury – Can The Defense Try and Use It to Bar Recovery of Damages? The defense can and will, if possible, point at a pre-existing condition or prior injury, as a reason that the jury should side with the defense and not pay damages for the plaintiff’s claim no matter how severe and serious they may be. However, Florida law protects plaintiffs and claimants in this situation. Under Florida law, the existence of a prior condition does not automatically bar a personal injury claim award. 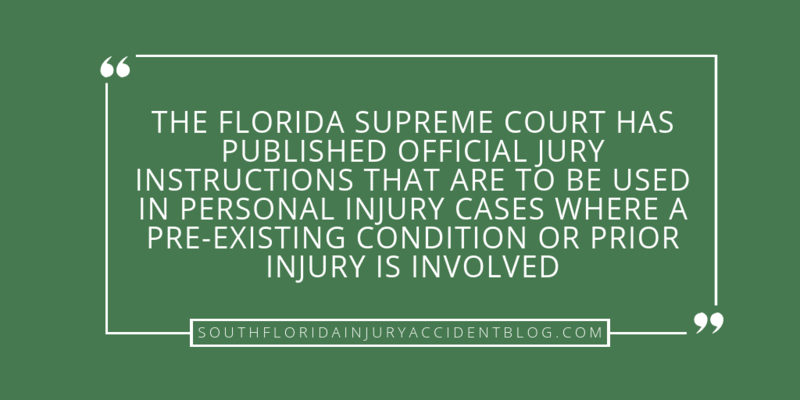 In fact, the Florida Supreme Court has published official Jury Instructions that are to be used in personal injury cases where a pre-existing condition or prior injury is involved. The Courts are required to use the following instructions to juries – judges (and trial lawyers) are given notes from the Florida Supreme Court on how these instructions are to be used in a particular case. These instructions control what the jury will use in deciding the damage amount awarded to the injury victim. This instruction is intended for use in situations in which a preexisting physical condition is aggravated by the injury, or the injury activates a latent condition. See C. F. Hamblen, Inc. v. Owens, 172 So. 694 (Fla. 1937). Instruction 501.5a is necessary where Instruction 401.12b, Concurring cause, is given. See Hart v. Stern, 824 So.2d 927, 932–34 (Fla. 5th DCA 2002); Auster v. Gertrude & Philip Strax Breast Cancer Detection Institute, Inc., 649 So.2d 883, 887 (Fla. 4th DCA 1995). 1. Instruction 501.5b addresses the situation occurring in Gross v. Lyons, 763 So.2d 276 (Fla. 2000). It is not intended to address other situations. For example, see Stuart v. Hertz Corp., 351 So.2d 703 (Fla. 1977), and Eli Witt Cigar & Tobacco Co. v. Matatics, 55 So.2d 549 (Fla. 1951). The committee recognizes that the instruction may be inadequate in situations other than the situation in Gross. 2. The committee takes no position on whether the subsequent event is limited to a tortious event, or may be a non-tortious event. A good piece of advice if you have been harmed and have a pre-existing injury, and are likely to face a jury, is to speak with an experienced personal injury lawyer before you file a claim to learn about some of the issues that can arise with these claims, including the type of evidence needed to prove a claim and the type and amount of damages you can recover. This is true even if you intend to file a claim without a lawyer because you don’t want to miss out on any damages that you may be entitled to collect for your injuries. Most personal injury lawyers, like Alan Sackrin, will offer a free initial consultation (over the phone or in person) to answer your questions, including what to include in a demand letter.